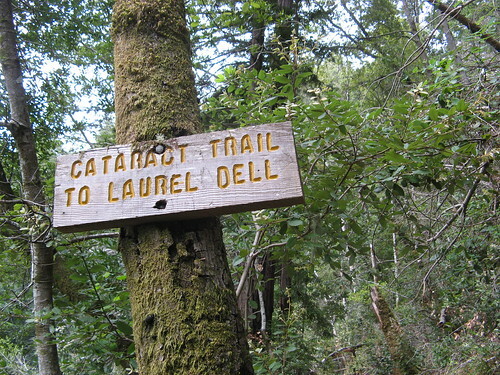 Cataract Trail starts out scenic enough, tracking the shore of the Alpine Lake Reservoir, then starts stair-stepping alongside the Cataract Creek. I was the first hiker on the trail Wednesday morning so I felt no qualms about shouting “man, what a view” at first sight of the first big waterfall. Mind you the major flow season is over, but there’s still quite a bit a water in the bigger creeks of the Mount Tam Watershed tumbling down into Alpine Lake. 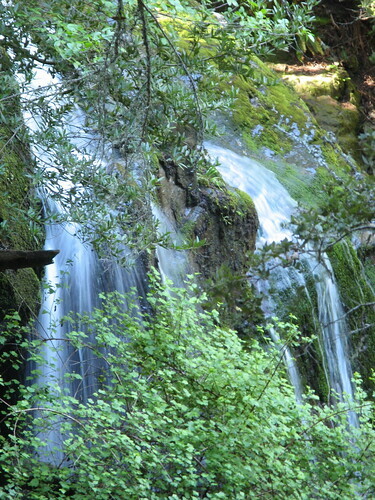 If all you’re into is waterfalls, you can do the three-mile out-and-back from the Cataract Trail to Laurel Dell. Take your camera, take your time and be ready for a climb: 1,000 feet in 1.5 miles one way, and all that knee gouging descent on the way back. 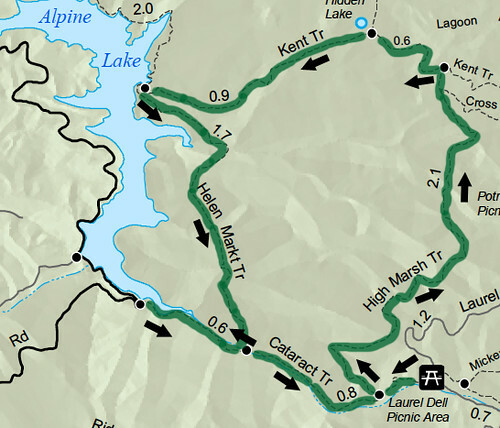 If you’ve got time to make a real hike of it, though, think about the 7.5-mile loop I took Wednesday. It’s a real beauty-and-the-beast hike: nary a flat stretch of trail the whole way, around 2200 feet of climb, with 600 in the last few miles just to remind you your boots were made for walking. I did the whole route to Laurel Dell, then turned back for a short stretch and took a right on the High Marsh Trail, an excellent path in its own right — lots of vistas, lots of trees, still lots of wildflowers, a couple pretty creeks to cross and a placid pond high on a hillside. The downleg on the Kent Trail gets steep in places, but it also tracks through a healthy stand of young redwoods. 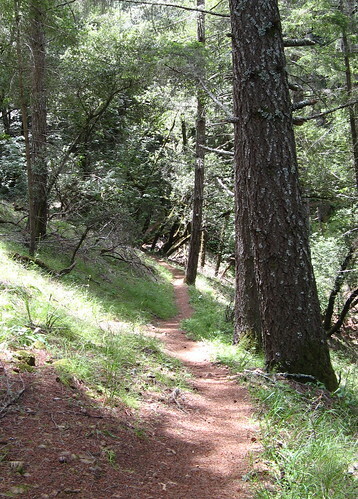 The final leg on the Helen Markt Trail can be a bit of a bear because it climbs a couple gullies to get back to Cataract Creek, but once you make it back there, it’s all downhill to the trailhead. This hike is well worth taking a mental health day from the job or setting aside a vacation day (or celebrating the lush freedom of unemployment; I hear there’s a bit of that about these days). I walked six miles before seeing another hiker — try that on a Saturday or Sunday. Once you’ve had these trails to yourself you won’t want to share. And besides, there’s always a parking space near the trailhead on weekdays. A sign lets you know you’re heading the right way. Alpine Lake is right next to the trail here. 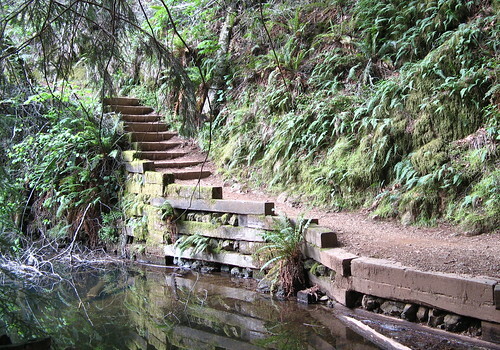 The steps are a regular feature all the way up to Laurel Dell. The lake is pretty when the light’s right. 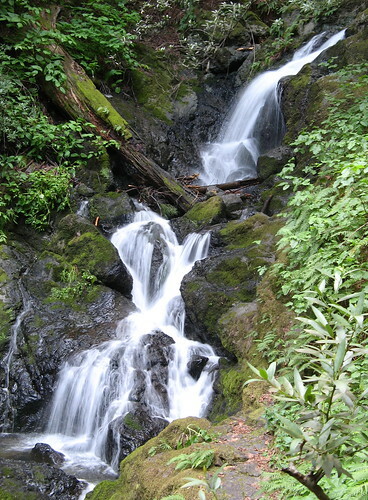 One of the first waterfalls of Cataract Creek. One big swath of Chinese houses was growing next to the trail. Practicing my blur technique. This is a one-second time exposure using my handy Gorillapod. 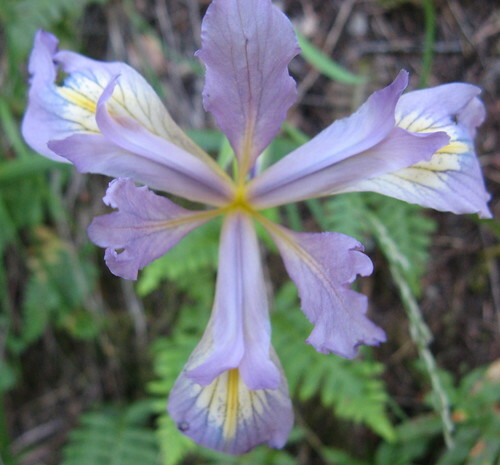 This is a fantastic year for irises, especially along Cataract Creek. 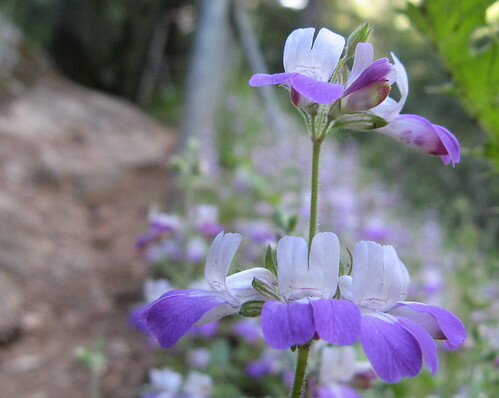 Most were white but a few purple ones bloomed. 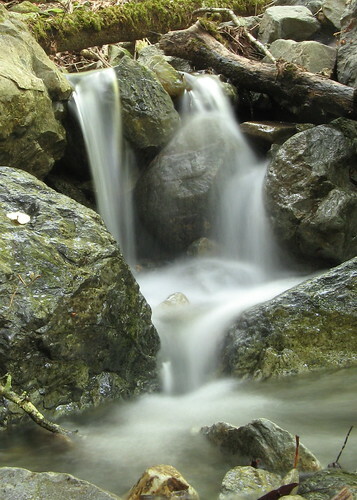 Last waterfall, not far from Laurel Dell. It’s perhaps the most interesting of the bunch, but very difficult to photograph. High Marsh Trail is mostly shaded but it has a few excellent vistas. 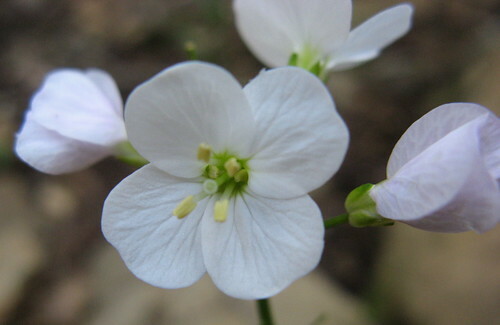 This picture is about 10 times the size of these little flowers I saw growing in the forest along the High Marsh Trail. High Marsh Trail crosses a couple forks of the Swede George Creek. This shot is a 3.2-second time exposure. 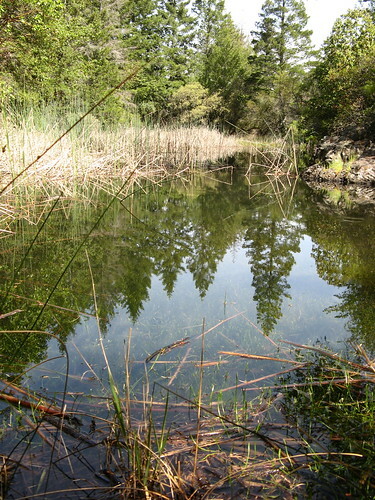 And, of course, the required High Marsh. Here’s a shot from the Helen Markt Trail. Nice path, but the up-and-downs get old after awhile. I feel sorta lame for not waxing more eloquent about this hike, but words are unequal to the walk. Main thing that springs to mind is how things are different in Marin because so many folks up there take conservation so seriously. 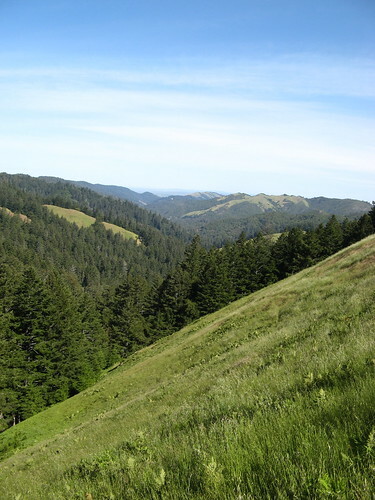 A hike like this makes you want to hug a tree-hugger. My first Cataract Trail hike. 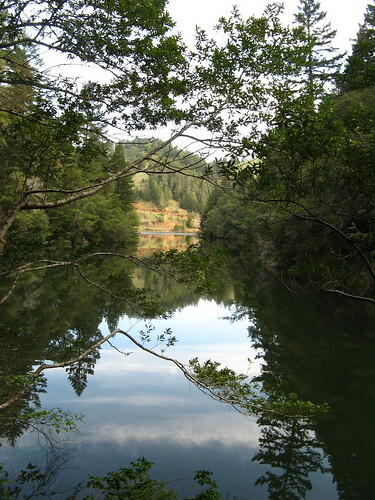 Marin Water District trails map (pdf download). Here’s a Google map to get you to the trailhead. Tom, that is a helluva hike – I’ve done it a few times myself! There’s more water splashing and bouncing over the falls than I would have suspected…testament to Mt. Tam’s deep well-springs capacity! Good ‘un, matey! 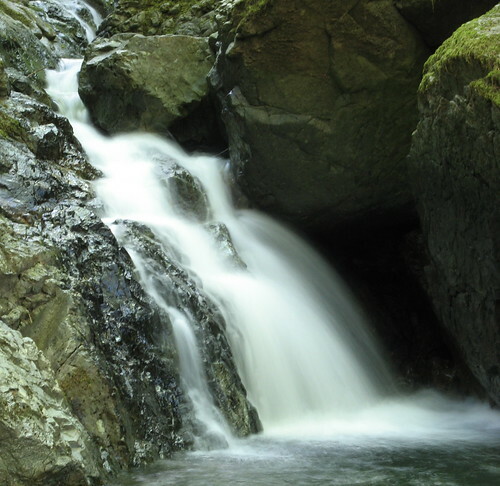 Tom, I revisited Cataract on Saturday – gadzillions of two-legged critters abounded – but was eminently rewarded with some really big water and lush scenery! Hopefully, a post soon! Doncha miss it! Crowds can’t ruin that hike, that’s for sure.